Farms in the KwaZulu-Natal Midlands played host to delegates from the Agricultural Sector Education Training Authority, AgriSETA, this week in order for the body to measure the positive impact it is, and will play, through project support, on the lives of young people in the agricultural sector in the province. Facilitated and managed by the KwaZulu-Natal Agricultural Union, Kwanalu, AgriSETA board members, Moleko Phakedi, Atwell Nazo and Danny Schutte, and acting CEO Frikkie Fouche met with some of the young Future Farmers participating in the Kwanalu and Future Farmer Foundation led project, working at three farms in the Midlands area to understand how the project was impacting on the lives of young people in South Africa. AgriSETA board member, Moleka Phakedi, speaking to Future Farmer students said that agriculture was the underrated creator of jobs in SA, and that the industry had the potential to create sustainable opportunities for the youth of the country. “We are here today to visit farms to see in person what impact funding by AgriSETA could make; to see programmes such as the Future Farmers Foundation in action and to report back to our board. Sustainibility is where we put our money,” said Phakedi. 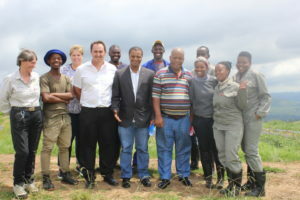 The AgriSETA delegation visited a grower-based export marketer of proteas in Hilton, a large commercial vegetable operation in Howick and a dairy farm in the Karkloof area where the AgriSETA board members engaged and questioned Future Farmers on their experiences, opinions and sustainability of youth training programmes and their views on the role they can play in agriculture today. Acting CEO of AgriSETA Frikkie Fouche told Future Farmer learners that AgriSETA’s mandate is to uplift the agricultural sector and to assess the impact funding can make on youth training programmes. “The reason for our visit today is for the board to determine the difference programmes such as the Future Farmers project are making. It is not only about a job but about the youth going on to create opportunities, and about sustainable growth,” he said. The Future Farmers Foundation, the brainchild of Howick dairy farmer Judy Stuart, is a unique social program which aims to cultivate the skills and ignite a passion for farming in young aspiring farmers, between the ages of 18 and 26 years old, by providing them with real job experiences in an agricultural field of their choice. The programme is designed to give young people the opportunity to “learn as they earn” by finding apprentice positions on local and then later, international farms, returning home to South Africa with their expertise. Today, with many successful placements of eager young South African farmers on farms in New Zealand, Australia, America and Denmark, Future Farmers has become a recognised role-player in the future of KZN farming with many “past” Future Farmer students not only working successfully on, but also managing large commercial operations in the province. To this end Kwanalu works tirelessly to secure funding for the Future Farmers programme with the objective of the realisation of bringing a joint vision of a skilled, motivated and dedicated “agricultural generation” to life. “Empowering the future farmers of tomorrow is our goal, and as a union, it is imperative that we are at the forefront of initiatives that promote and create new opportunities in our sector. This past year we have facilitated the “employment” of 200 unemployed graduates and placed them on farms where these young people have, in most cases, excelled and are in management positions. The Future Farmers Foundation enables transformation of our youth by empowering them to take responsibility for a sustainable and viable future,” she said. “The next step is looking to, and encourageing, government to recognise these incredible, skilled, young commercial future farmers being grown in our province. It is these young farmers who could potentially play a role in a change around strategy on many of the failing farms, to bring about transformation, economic growth and directly impact on food security on a commercial scale,” said La Marque. Is your “20 Minutes of Transformation” initiative on track?